Waar komt de jongen met de rode trui op het hek vandaan? Wanneer werden de golfbaan en het hek gebouwd? Wat was er twee jaar eerder? En honderd jaar geleden? En 80 miljoen jaar geleden? En oneindig jaren ervoor ? En wat zal er in honderd jaar zijn ? In twee miljoen jaar ? Birdie presenteert zich als een caleidoscoop van mogelijkheden gegenereerd uit de analyse van bovenstaande foto. Een mash-up van inzichten over hedendaagse migratie, het vrije verkeer van goederen en kapitaal, de geschiedenis als een oneindige herhaling, de vrije maar onvermijdelijke migratie van zwaluwen (het zit in hun DNA), de kracht van beelden of hun hulpeloosheid. Een voorstelling met straffe videotechnieken, zwarte absurde humor en scherpe maatschappij kritiek. Agrupación Señor Serrano, opgericht door Alex Serrano in 2006 te Barcelona, maakt innovatieve technologische producties die theater, dans en video-art combineren om de menselijke perceptie te verkennen. In 2014 presenteerden ze in Monty A House in Asia en Brickman Brando Bubble Boom (BBBB). Agrupacion Senor Serrano kreeg in 2015 een Zilveren Leeuw op de Biënnale van Venetië. Birdie is a project that tries to analyze this image from every possible angle: formal, technical, semiotic, anthropologic, sociologic. Trying to understand its appeal, to deconstruct its force. But Birdie is also a project that starting from the moment that the picture captures is going to project its tentacles to the past and future of some subjects present in the image (Where does the guy with the red sweater on the fence come from? Where is he going? What’s the story of the golf ball? What about the normal live of the golf players? What’s the policeman between the trees looking at? More questions: what would happen if instead of a golf course in front of the fence, we had a supermarket? What if we had a common family living room, with all the family members watching this picture on the TV News? What if there was a woman reading a Schopenhauer’s book in a public library? A guy checking his FB account on his cellphone while smoking a cigarette in a parking lot? Would these modifications on the content of the scene change our perspective? Do these kind of pictures (shocking, meaningful, brutally human) really have an influence on “real” life, have consequences? 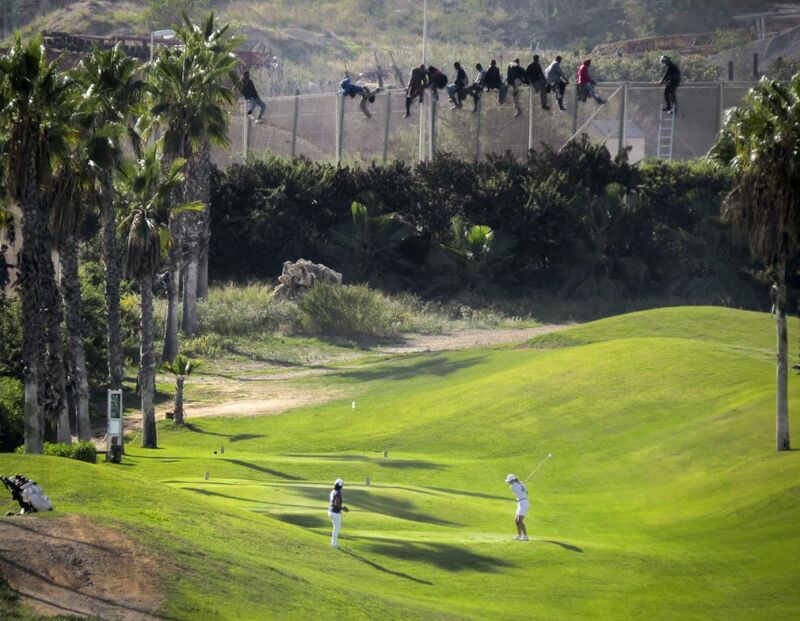 Furthermore, what about the golf course and the fence, when were they built? What was there two years ago? And one hundred years ago? And two thousand? And 80 millions years ago? And n before? And what will be there in one hundred years? In two million years? To conclude, Birdie presents itself as a kaleidoscope of possibilities generated from the image up here. A mash up of interpretations and perspectives regarding contemporary socioeconomic migrations; the movement of commodities and capital; history as a never ending return of the same events with different faces; the free (without borders) but at the same time inevitable (carved in their DNA) migration of swallows; the power of images; or their helplessness. On stage, a big table with a scale model recreating the golf course picture. But a scale model that is much more than that, a scale model reproducing the scenarios where all the plot lines suggested before find their place. And technology capturing, transforming and projecting it: video cameras, screens, projector and computers used at their full capacity (live video, birds tracking software, internet searches, stock exchange market investments done live, worldwide airplanes radar in real time, information sharing, social networks and much more). And three performers handling this entire messy world with wit, criticism and commitment with mankind.